Youngsters taking part in a Cramlington Rockets Tots session. Northumberland-based rugby league club Cramlington Rockets are breaking new ground with the launch of Rocket Tots. A fun, multi-sport development programme for two to six-year-olds, it is the first time the club has offered opportunities at this age group and now means local people can join the club from the age of two all the way up to adults. The aim of the sessions is to encourage social skills, increase physical development and confidence and, most importantly, have fun. Having only launched on Monday, March 14, over half the available places are already taken. With sessions led by experienced coaches from Rockets Community, the club’s award-winning community arm, community manager Steve Beaty said he was excited to launch the programme. “Rocket Tots is a big step forward for the club and the local children,” he said. “The response to our Tots activities in the schools has been outstanding and we are looking forward to replicating that on Saturday mornings. For us, adding Rocket Tots is the missing part of the jigsaw. “The Rockets are known for having a unique family environment that focuses on development and fun, and we are thrilled to be able to offer that to our youngest members. 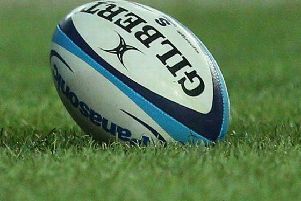 “It is multi-sports so it means those that love rugby will get to run around with a rugby ball while also trying other new sports. Sessions take place on Saturdays with only 15 spaces available for each session. Block one to six weeks is from April 16 to May 21 at Cramlington Learning Village. For two to four-and-a-half-year-olds it is on from 9am to 9.45am; then from 10am to 11am for four-and-a-half-year-olds to six-year-olds.